If you're building a powered PA system on a budget, Peavey's time-tested PV series is always a solid choice -- including the Peavey PV115PM powered floor monitor. With 200 Watts total power output and Class D amplification onboard, this two-way monitor is at the ready to fuel your stage fire. Whether you're a solo vocalist or the lead guitarist, you'll perform better, simply because you'll be able to hear anything and everything that gets pumped through the PV115PM. What drives Peavey's PV115PM powered monitor system is a bi-amplified Class D power section comprised of a 15-inch woofer with a 2-3/8-inch voice coil, and a 1.4-inch titanium diaphragm 14XT compression driver. In other words, the PV115PM can deliver 200 watts of full-spectrum audio to help you be heard on stage. Best of all, built-in amplification means you get incredible performance without having to worry about external amps or powered mixers. Automatic equal loudness (Fletcher-Munson) compensation keeps levels in check by ensuring that bass and treble frequencies sound great even at low volume levels, while the PV115PM's woofer servo feature provides reduced woofer distortion while keeping the overall monitor design slim in a compact, space-saving enclosure. DDT speaker protection circuitry senses and prevents clipping by offering light compression when levels get out of hand. The PV115PM conveniently has a combination jack with 1/4-inch TRS and female XLR mic- or line-level balanced input, along with two 1/4-inch phone jacks for link-out and direct-in capability. The power switch and volume knob are placed right in front, so you don't have to crane your neck to take care of your connections. If you're running your own sound, the PV115PM makes a great floor monitor. Plug it in, set it, and forget it. Easy to use and even simpler to set up, the 1x15-inch monitor does what it's supposed to do without requiring anything special on your end. zZounds is an authorized dealer of Peavey products. 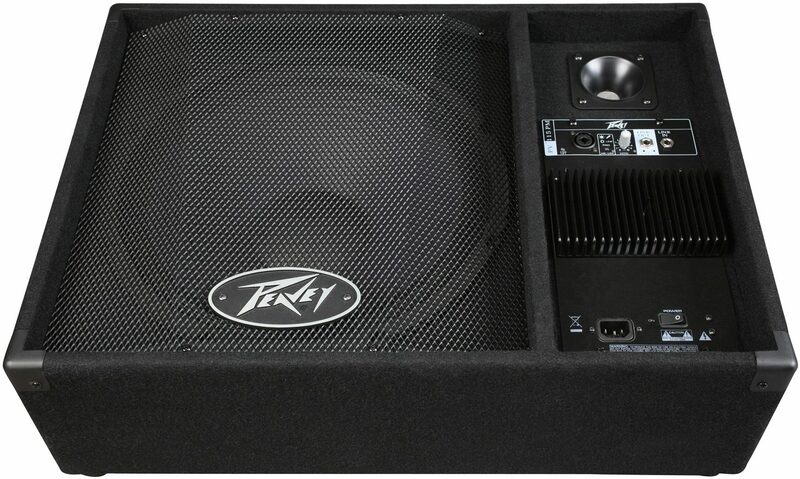 The Peavey PV115PM is a two-way powered monitor system engineered with a bi-amplified class D power section that drives a 15-inch woofer with a 2 3/8-inch voice coil and a 1.4-inch titanium diaphragm 14XT (tm) compression driver with 200 watts total power. The high-speed amp topology yields the highest audio resolution and efficiency available, and combined with the woofer's neodymium speaker magnet, yields extra-light weight. "Great Drum and all purpose Monitor"
Sound: Great bottom end and screeching highs. The sound spectrum is excellent. As a drum monitor it works excellent. As a general PA cabinet it's not bad either! Feature: The built in amp meant I did not need another external amp or powered mixer. I just connect the drums, mic and MP3 to the mixer, mixer to the monitor and it's all good! This unit also allows chaining to another like monitor. I am considering adding a second as a backup for my mains if ever needed. The pole mount also came in really handy. The carpeting cover looks great in the studio, I have not had experience with this covering while on the road. Ease of Use: Took about 10 minutes of fine tuning the EQ and sound level to get the sound I wanted. I think it's ease of use is about typical of any other amplified cab. Quality: This monitor is a tank! (And almost as heavy!) Solid, no rattles. Should stand up to years of use. I take good care of my equipment and don't thrash it. The fact that it has an amplifier built in should mean a little added caution when lugging it around. Always treat electronics with care! Value: I think it is well worth the price, not only as a drum monitor but it works nicely as a main too! Manufacturer Support: No contact - never needed with any of my Peavey gear. The Wow Factor: All Peavey gear looks great. The name has always been associated with quality, so seeing it relays that I do not fly on the cheap! You see the Peavey logo as it replies "Class!" Overall: I purchased this unit mostly as a monitor for my Alesis DM8 Pro Kit. The Alesis drum monitor just did not have the guts to get a good groove going. Having experienced the hardiness and performance of Peavey equipment, I thought I would give this a try. Once I had it set up and equalized, it blew me away! Style of Music: Light rock, country, electronica, and others. 12 of 13 people (92.31%) found this review helpful. Did you?